cheesecakes are one my favorite things to make and eat. I tried this recipe with mango pulp instead of strawberries also and it came out excellent. Gelatin Powder – 3 tbsp. Take strawberry cut it into small chunks. Mix fresh cream, cheese cream, sugar and strawberry chunks. Take a pan add 1/4 cup water in it and dissolve gelatin powder on low flame. When gelatin powder has been dissolved then add it to cream mixture and mix it well. Crush biscuits into powder form and add melted butter and mix it well. Take a cake pan add biscuit mixture in it and press it with hand to level the surface. 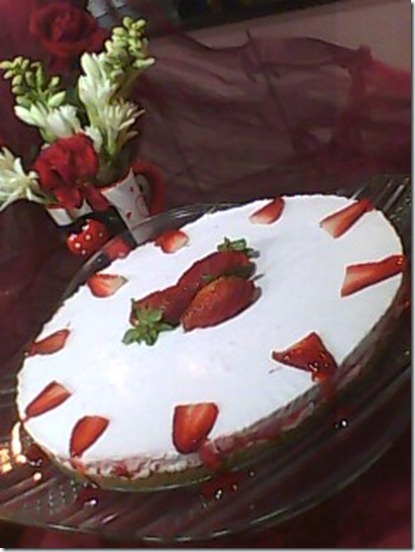 Add cream mixture in strawberry syrup and cover it with plastic wrap, and put it into the freezer for 2 hours.